Spotted at Tartine (7217 Perrier Street, 504.866.4860): bialys, short for bialystocker kuchen, the storied bagel-cousin beloved by many, but rarely seen in the U.S. outside of the urban Northeast. Made from a bagel-like dough, the bialy isn’t boiled, and in place of a hole, a central depression is filled with onions, poppyseeds, and/or breadcrumbs. Mimi Sheraton traced the bialy’s history back to its Polish Jewish origins in The Bialy Eaters, and she found that the bread is extinct in its home city, wiped out during the 20th century along with Bialystock’s once-vibrant Jewish population. I’m thankful to live in a tolerant society, where Jewish pastries show up in French-inspired bakeries, eaten and enjoyed by people who’ve never been to Poland. Happy Thanksgiving week…. I’ll have to check ’em out….love the name. I fell in love with their turkey burger, and I don’t normally like those at all! The condiments were just so super good. Bialys…indeed a rarity in these parts. Do you know if Maple Patisserie makes them? The owner/baker is Polish and his challah is the best in the city. Thank you, Celeste. Incidentally, re Hamburger Co..was there and did not like it, seems to be one of those “trendy-snob appeal places”. My partner and I left hungry, after having miniscule hamburgers and a side order of fries which we could fit in our fisted hand. When the check came..what a shocker! No matter, they will do well? Why? Uptown location, “in” place. One should not leave a restaurant feeling hungry (we are both on the slender side). When I want a hamburger, I want a hamburger such as Phil’s grill. Frankly, I am not too impressed with any of the new eateries on Freret, having tried them all, Idon’t think we get a bang for our buck. Haven’t seen bialys at MSP, but Ziggy might make them upon request. I keep asking for soft pretzels, to no avail! 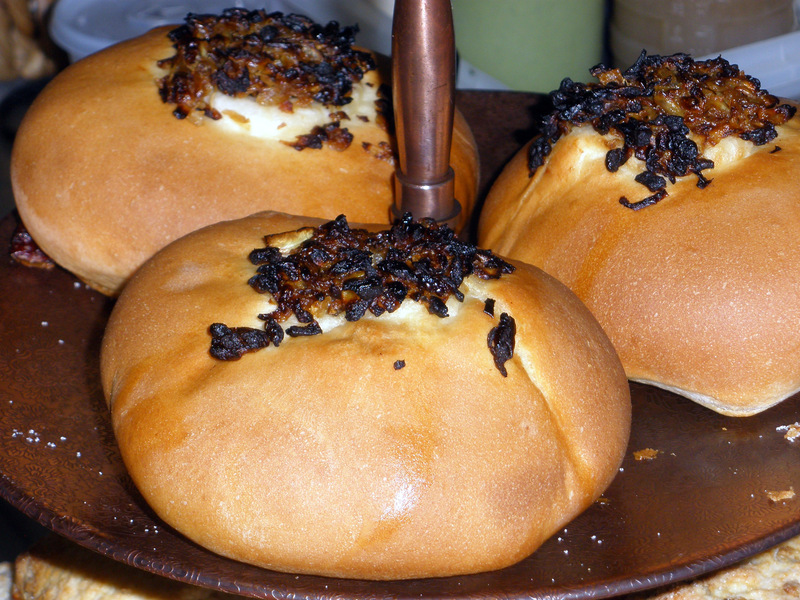 I once heard a guy in a deli in DC describe bialys to a customer as “Jewish focaccia.” Not a bad explanation, but not one that would make sense to a lot of people. I’ll have to go try these. Compared to the bialys I’ve encountered elsewhere, Tartine’s bialys are puffier, darker brown, and more generously filled.